Two Macron East Sussex Football League clubs are through to the quarter-finals of the Sussex Intermediate Challenge Cup. Hollington United and Sidley United booked their places in the last eight of the historic county knockout competition courtesy of splendid victories on Saturday. A Hollington United player closes down the Rustington man in possession. Unbeaten league leaders Hollington triumphed 4-1 at home to a Rustington side which lies second in Southern Combination League Division Two - one level above them. In chilly sunshine at Gibbons Field, Hollington opened up a two-goal first half lead before consolidating their advantage with two more goals after the break. Grant Payne (2), Sam White and Glenn Woodhurst were Hollington’s goalscoring heroes against a Rustington side which has lost only one of its 13 league games this season. Sidley, who are seventh in the Premier Division, prevailed 4-3 after extra-time away to Southern Combination League Reserve Section outfit Mile Oak II. Two Hollington United players close down a Rustington opponent. 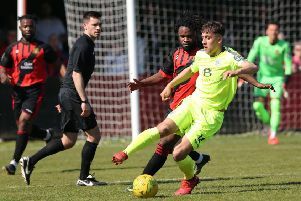 The Blues were two-up at half time, but Mile Oak came back to force an additional half-hour after making it 2-2 at the end of a lengthy period of added time. Sidley eventually prevailed in extra-time, despite finishing with nine men after having one player sent-off and another go off injured. Sean Baldwin (2), Jordan Uttley and James Bailey were Sidley’s scorers. Hollington will travel to Lancing United or Arundel reserves in the last eight on January 13, while Sidley will host Angmering Seniors. The bulk of the weekend’s scheduled league programme went ahead despite the low temperatures and heavy overnight frost. A Hollington United midfielder pressurises the Rustington player in possession. Three games were played in the Premier Division and Robertsbridge United moved up to fourth in the table by winning 1-0 away to a Bexhill Town side which started the day above them. A second half header from Guy Ballard gave Robertsbridge the points. Sedlescombe Rangers climbed up to sixth on the back of their second successive 2-1 victory, this time at home to ninth-placed Hawkhurst United. Ore Athletic ran out 5-0 winners in the battle of the bottom two away to Crowhurst. Scott Ramsay (2), Luke Towner and Jason Callow were Ore’s scorers in their second league victory of the campaign. Second-placed Battle Baptists had their match away to St Leonards Social postponed so with none of the top three in league action, it’s as you were at the summit with leaders Hollington a point clear of Battle and a further point ahead of third-placed Rye Town. A St Leonards Social II player on the ball against Peche Hill Select. Three matches also went ahead in Division One and Westfield II soared into the top two courtesy of a 2-0 success away to Hastings Rangers. Second half goals from Alan Johnson and Marc Barden gave Westfield, who have played more games than the teams just below them, a fifth consecutive league victory. They even had the luxury of missing a penalty. Mountfield United missed the chance to move into the top half after losing 3-1 at home to seventh-placed Wadhurst United. Some nice work from Leon Pettit led to Sean Smith scoring the only goal for Mountfield, whose man of the match was Ed Crowhurst. Herstmonceux climbed out of the bottom two by dint of a 4-0 victory at home to Little Common II. Toby Guest (2), Connor Liron and Toby Funnell got the goals. Icklesham Casuals extended their lead at the top of Division Two on the back of a 5-0 success at home to Bexhill Rovers. More action from Hollington United's 4-1 victory over Rustington. Two goals apiece for Charlie Cornford and Steffan Davies, and one from Michael Amar, put Icklesham five points clear of second-placed Sovereign Saints, albeit having played two more matches. Fourth-placed Hollington United II went level on points with third-placed Bexhill United II after winning 3-0 away to Battle Baptists II. Jay Edwards, Michael Shaw and Rhys Warren hit the target. Peche Hill Select moved above St Leonards Social II into the top half after beating them 2-1 at Tilekiln. Punnetts Town went top of Division Three by winning 5-2 away to Victoria Baptists. Jack Divall (2), Louis Walder, Daniel Ransom and Anthony Harvey scored for Punnetts, who have now chalked up nine league victories out of nine, scoring 53 goals and amassing a +42 goal difference. Previous leaders Sedlescombe Rangers II, who have played three games more than Punnetts, dropped to second on goal difference after being held to a 2-2 draw away to Sandhurst. The goals of Toby Hicks and Liam Baker for Sedlescombe were matched by William Mantle and Jason Baldock for fifth-placed Sandhurst. Fourth-placed Catsfield won 5-2 away to Magham Down, whose goals came via Jake Barker and Jamie Bundy. Bexhill AAC II consolidated top spot in Division Four via a 4-1 triumph against South Coast Athletico. Dominic Sinden, Max Thomson, Lewis Wade and Ashley Wiggins found the net for AAC against an Athletico side whose goal was scored by Wayne March. Second-placed Orington, who are four points behind AAC with a game in hand, kept up the pressure with a terrific 7-1 victory away to Cranbrook Town. James McGrath plundered a hat-trick, Adam How bagged a brace, and there was one apiece for Andy Swindles and Scott Quested. Bexhill Broncos moved back above Athletico into third, but had to make do with a 2-2 draw at home to sixth-placed Parkfield. Gary Purssord and Ryan Meechan were on target for Parkfield. Fifth-placed Sovereign Saints II were the day’s highest scorers after winning 8-3 at home to West Hill United. Daniel Wilkes bagged a brace and Ayrton Ellis got the other for West Hill. Two unbeaten league records were on the line as the top two went head-to-head in Division Five. Sedlescombe Rangers III prevailed 1-0 at home to Hampden Park to go back to the summit - three points ahead of their title rivals. Rob Dale scored the all-important goal in the second half. Herstmonceux II moved up to fourth - level on points with third-placed Robertsbridge United II having played an extra game - courtesy of a walkover after scheduled visitors West Hill United II were unable to field a team. Battle Baptists III dropped below Herstmonceux to fifth following a 1-0 defeat at home to Wittersham II, who are up to sixth. Icklesham Casuals II have won four, drawn four and lost four of their 12 league fixtures after a 4-1 success away to Beckley Rangers. Benjamin Dengate grabbed Beckley’s consolation against an Icklesham side for whom Adam Knight, Lee Pierce, Daniel Russell and Solomon Cooke netted. One cup tie was played and Division Two high-flyers Sovereign Saints won 6-0 away to Division Three outfit Pebsham Sibex in round two of the Wisdens Sports Challenge Cup. Saints will face Sedlescombe Rangers II in the quarter-finals in the new year. A full programme of league action is scheduled for this coming Saturday before the league takes its festive break and returns on Saturday January 6. St Leonards Social II on the attack against Peche Hill Select. Action from the Division Three match between Peche Hill Select and St Leonards Social II.